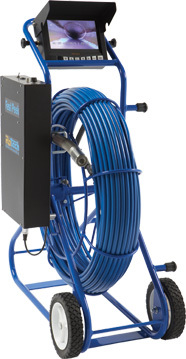 Ratech’s All-In-One, fully portable Fast Peek© video inspection system is the result of customer feedback requesting a compact, lightweight inspection system for service line inspection. Located on the handle, the 7.0" bright LCD monitor can easily be adjusted to a comfortable viewing angle by the operator. Easily accessible top mounted monitor controls include power, mode, aspect ratio (screen size) and menu plus set buttons for various on-screen menus. An adjustable sun hood is included to act as a sun shield as well as a screen protector for the monitor when transporting the system. Mounted on the side of the unit is the AC/DC power source which includes controls for all camera functions such as camera test terminal, AC/DC input, Video/Audio I/O, condenser microphone with on/off switch and keyboard input. Keyboard for titling is also included. Now add an optional SD digital card recorder or laptop interface to further enhance your recording options. • Roller Skid for 6", 8" and 10" Straight Runs.